The yellow main menu, and pink index bars at the top of pages will easily take you anywhere. Lost? "Home" is top page. The Search tab has an engine for specific requests or order numbers. Still can't find it? Email us for images, mininum order quantities, and prices. 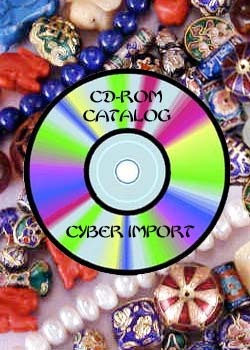 Cyber Import catalogs are only available on-line. Our website has over eight thousand pages. Prices change daily. A printed version is just no longer practical. Log on and save a forest! The Internet and broadband have changed marketing worldwide. The trend to be on-line dependent without a brick and mortar store lowers the prices for customers. Cyberspace is where we now do all our business. We're as close as your nearest computer.